The tarpon is one of the greatest fish that swims past the Florida Keys. Annually thousands swim past, around and through the warm, tranquil waters in one of nature’s great animal migrations. These creatures have made this journey since the oceans receded and exposed the Keys. Since the 1800s anglers from around the world travel to the string of islands in Southern Florida hoping to connect with one of these magnificent fish. During the spring migration guides are booked years in advance, some spots being passed on to another angler when the incumbent can no longer use the spot. Anglers pursue these creatures with a zeal bordering on obsession. The fish itself fuels this passion and the pull of a tarpon on light tackle is unmatched in the fishing world. So it is with this in mind that I set my mind to catch one of these creatures. Being a man of simple means, I chose my kayak as the vessel to take me into battle with these fish. Living in the Keys gives me ready access to some excellent spots, and one of them happens to be just across the channel from the canal where I live. On a Sunday afternoon in the middle of summer, I set out to a desolate key in the middle of the channel. The trip was hot, with little wind and few clouds to provide a breeze and shade making paddle that much more interesting. After paddling for forty-five minutes, I switched to fishing mode and began my approach to the key. The tarpon I was seeking were not the big migratory fish but smaller “baby” tarpon. 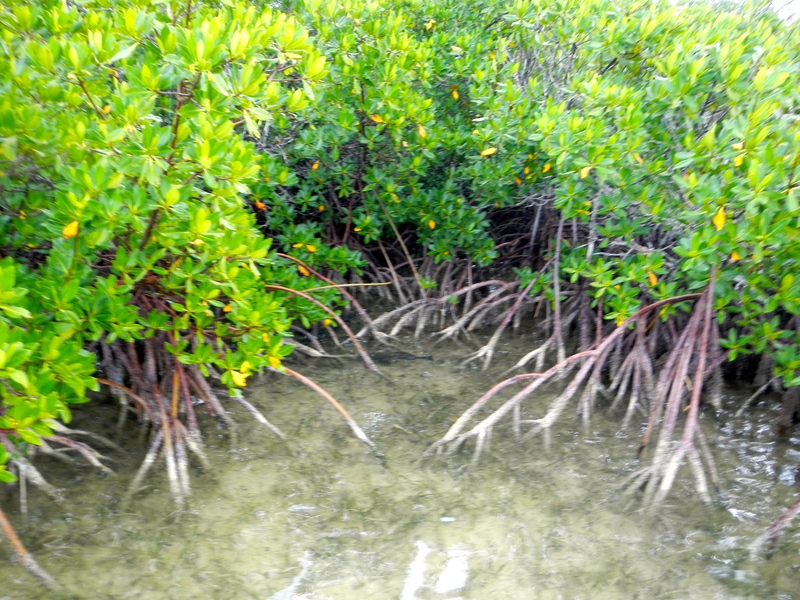 These fish average between ten and thirty pounds and often haunt the edges of the mangroves. On a previous trip I observed some of these smaller tarpons rolling near this particular key. This trip I carried my ten-weight Temple Fork Outfitter rod rigged with a Rio tarpon leader and Black Death fly tied on. I approached the key’s southern tip, as the wind was from the southeast and I wanted to slowly drift along the eastern edge from south to north. I broke out my small kayak anchor and readied it for quick deployment. Finally, I stood up, and began my stalk along the edge of the key. The water was about a foot and a half to two feet deep, and stained a light tea color from the tannins coming out of the mangroves. As the light wind pushed my along, I held myself about twenty feet off mangroves, frequently pausing to watch for rolling fish. It did not take long for me to spot the first roller, about forty yards north along the key’s edge. The anticipation grew in my gut and my knees became wobbly as I silently drifted closer to the rollers. A year previous I hooked into a tarpon off another key, no sooner then I set the hook did the fish leap out of the water and throw it back at me. That moment stuck in my mind as I approached and slowly slid the anchor over the side and came to a stop about forty feet from where the tarpon last rolled. Enter your email address to follow BonefishZen and receive notifications of new posts by email.